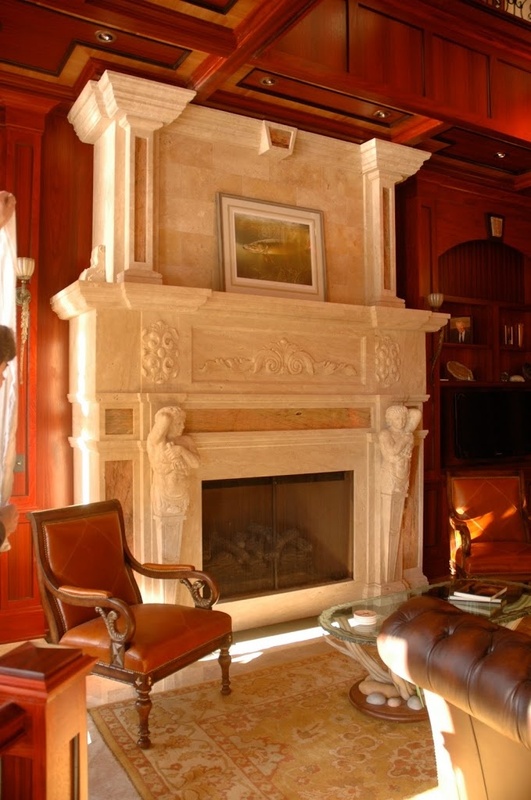 Travertine is a popular material for fireplace designs because it can take on a great amount of detail. Travertine is a softer stone, which makes it easier to carve. The stone is naturally formed in mineral springs or hot springs in many areas of the world. In its natural state, travertine has many holes that are often filled to make the material more durable. Travertine is available in tan, white, cream and rusty colors. 1. This two-story travertine fireplace makes a statement in this living room. It features columns on top of the mantel and on either side of the fireplace hearth. 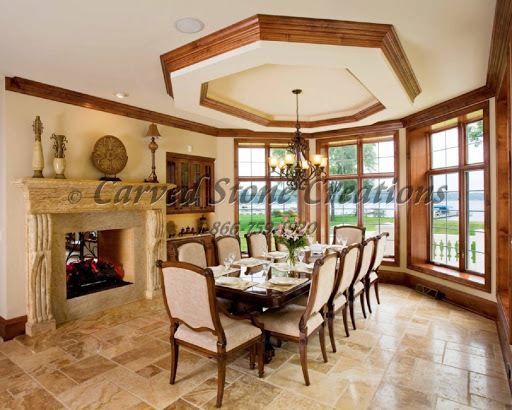 The golden travertine stone color gives the room a warm feel. 2. The fireplace shown below features simple carved details to complement the elegant look of the dining room. The cream color of the travertine stone keeps with the rooms neutral color palette. 3. 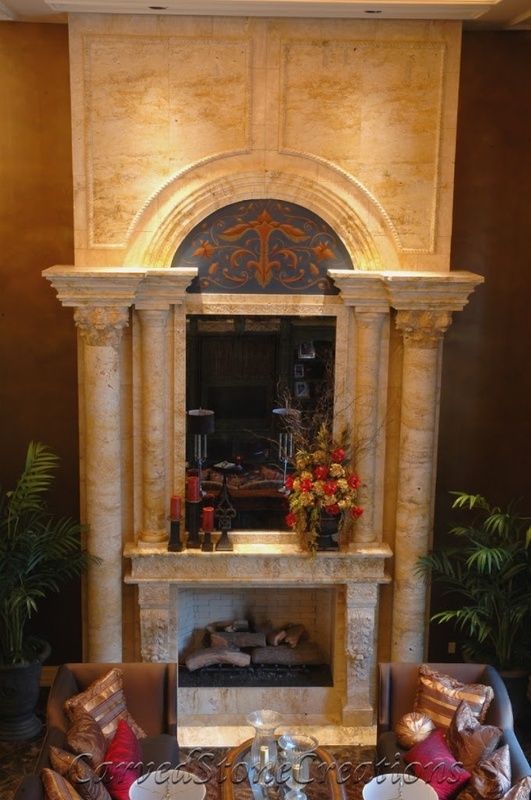 This travertine fireplace features an overmantel with matching carved details. The classic design has columns flanking each side of the hearth, along with a simple mantle shape that pulls the whole design together. 4. 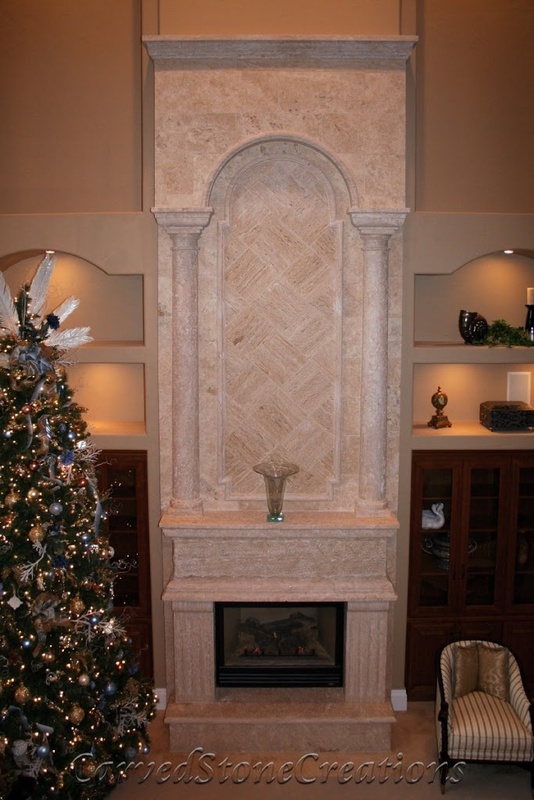 This two-story travertine fireplace design looks simple at first glance, but a closer look reveals subtle details. The grain of the stone in the overmantle creates a weaving pattern. 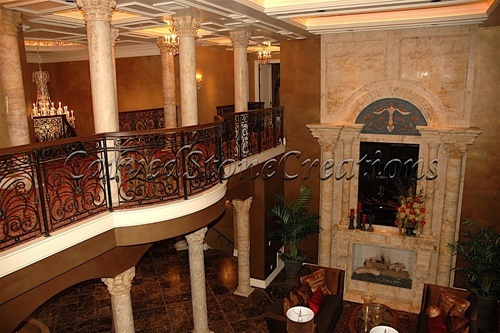 The columns on either side of the overmantle accentuate the height of the design. 5. This fireplace design has multiple intricate carved details, from the column carvings to the statuary pieces on either side of the hearth. The darker inlaid stone pieces make the carved details stand out. 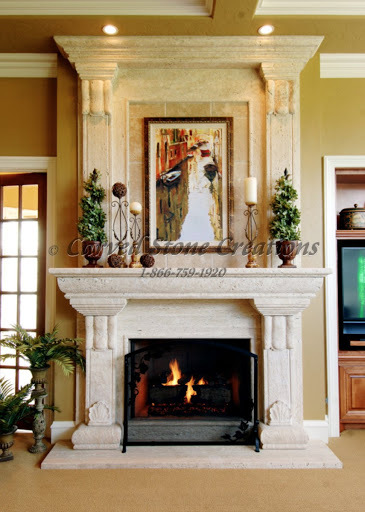 Stone fireplaces can be carved from many different types of stone. Choose the best stone for your fireplace, and start the design process today. Download our free fireplace design guide to get started.